There is a new way to market products to consumers and get the attention of potential employers. It is called content marketing. The way it works is this: you publish articles (content) on a blog, and people looking for information using a search engine will find you and learn to like, trust and respect you (marketing) through your writing. Specifically, you’ll need to publish articles that show off your expertise on a particular niche topic or in a particular field of study. By drawing people to you who find your content useful and interesting, you demonstrate that you are both a knowledgeable and effective communicator. In the process, you will develop a relationship of trust and respect, which becomes the foundation for a sale or job offer. Some companies and small businesses buy content from professional writers, but you are better off writing content for yourself. Not only will you improve your understanding of the topics you write about, you will improve your digital literacy skills and your ability to communicate ideas in your field clearly and coherently. But what should you write about? 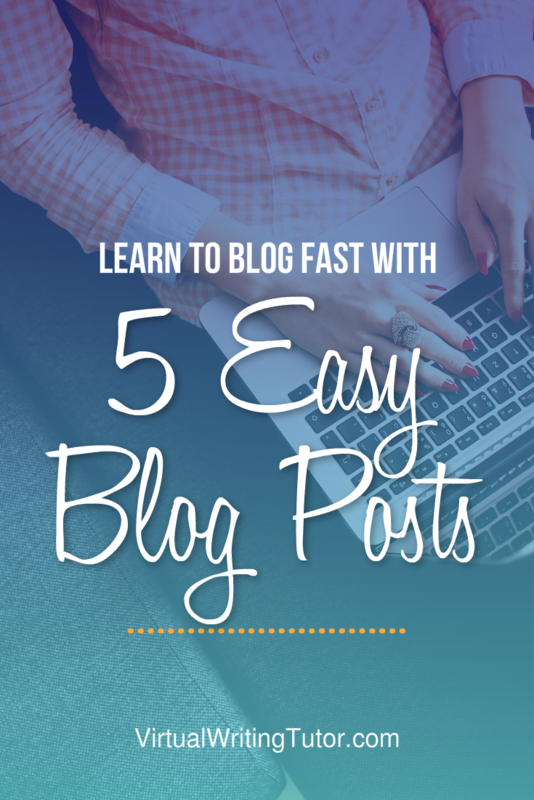 Here are 5 easy blog post ideas to get you started. Make a list of the top 3, top 5 or top 10 products or reasons for action in your field. Put the list in order from best to worst or worst to best. Make each item a numbered heading, and write one or more paragraphs that explains why the item is on your list. Give your listicle (list + article = listicle) a title along the lines of 10 things every person needs, or 5 reasons to do X, and publish it on your blog. Google will find you and then anybody looking for information on that topic will as well. Examples of listicles abound. This article is a listicle. Another listicle related to blog writing is here. Googling the search terms “5 best” + your keyword or field of interest will generate a list of articles to model your listicle on. 2. Create a walkthrough of a useful website. The second most popular search engine on the internet today is the YouTube video search engine. Apart from music videos and funny home movies, people also search YouTube for information about websites and software. For example, before creating an account on a particular website or laying down money for software, many people search Youtube for a walkthrough. Video-walkthroughs are short videos in which experienced users explain how to do a particular task with a website or program by speaking while doing the task. Video capture software like CamStudio or Camtasia Studio records the action on the screen and the expert’s voice. Since viewers are primarily after information, they do not expect perfect video production or superb voiceover talent. For bloggers, this suggests an easy way to create popular content that people will watch and share. Simply visit a website of interest, record yourself talking about how to do something specific with the website, upload it to YouTube and use the embed code on the “share” tab to embed your video walkthrough into a blog post. To make sure Google finds your blog post, write a well-structured summary of what you said above the video. Search engines will use the keywords in your blog post URL, title, headings, text, and image alt-tags text to determine what your webpage is about and send people to your website. 3. Summarize and paraphrase an article or podcast. Here is a common journalism trick that young reporters learn early on. Find an article that will interest your customers, summarize and rewrite it in your own words. Paraphrase all quotes in the article and then add a new angle or development in the field that was not in the original article. Do not copy and paste. Your article must be completely reworded. Use the Virtual Writing Tutor’s Paraphrase Checker to help you reword your article. If you plagiarize, you will be caught and you will earn the reputation of being a cheater and a fake. Not good. If your source writes, “Artificial intelligence is revolutionizing the legal sector and threatening to replace paralegals with data-mining algorithms,” you can write, “Robots are beginning to compete with paralegals for jobs at law firms.” Remember, blogs are conversational and informative. If you reword and summarize the original text with a more conversational tone, your readers will prefer it to the original. Be sure to link to the original article and give credit where credit is due. Make a list of the 10-20 technical terms or semi-technical terms that people in your industry use. Use the name of your field of study or English program name in the title of your glossary blog post like, “Police Technology Glossary” or “Glossary of Terms for Medical Imaging.” Do a Google search using the word “define” + the word you want to be defined. Then switch to the HTML mode of your blogging platform and define your vocabulary list using the web standard. Google and other search engines will put your glossary high up in the search results if your posts are standard compliant. Use <dl> and </dl> to contain your definition list. Use <dt> and </dt> to contain each term. Use <dd> and </dd> to contain the definition of the preceding term. Alternatively, use this HTML glossary template. 5. Create a hypertext narrative. Set yourself apart from other blog writers by including a short hypertext narrative among your blog posts. Most blogs are non-fiction, so a hypertext narrative will bring fiction readers to your blog and give non-fiction readers an unexpected treat. Use hypertext narrative authoring tools like the Virtual Writing Tutor’s HyperText Narrative Creator or use an HTML Hypertext narrative template. Whichever you choose, make it specific to your niche market. The novelty of hypertext fiction will get the attention of readers. The length and keyword density of your text will get the attention of the Google search engine. These five types of blog posts are highly effective ways to market yourself as an expert in your field or niche market, but writing them is only half the battle. To ensure search engines find you and put you high up on the first page of their search results, you will have to do three things. The first is to use and reuse keywords specific to your field. If your goal is to market yourself as a paramedic, make sure to use the words “Pre-hospital Emergency Care” and “paramedic” in your text, headings, image captions, tags, and titles. This will improve your visibility to search engines. But just because you are visible does not mean you are valuable. The second thing to do is to link to high-quality websites and ask fellow bloggers to link to you. The quality and number of outbound and inbound links will help to push your content to the top of the list when people google you. The third thing you must do is to eliminate your grammar errors with a grammar checker like the Virtual Writing Tutor. Nobody likes to read articles that are filled with spelling mistakes and grammar errors. It’s a turn-off. Error-free blog posts that are full of useful information related to your field of interest will immediately create a relationship of trust and appreciation between you and your readers. And that’s good marketing.